Experience the touch of Chantabun riverside community, the 300 year-old vicinity on Sukhapibal Road, the first street of Chantaburi. Riding the bicycle around town to visit gem market, Christian Church or enjoy food shopping and refresh yourself at Pliw Waterfall before finishing the trip on the Eastern scenic beach route, Chalermburapacholatis street. 10.00 – 10.30 hrs. Arrive Chantaburi downtown. Pay respect at City shrine and King Taksin Shrine. 11.00 – 11.30 hrs. Arrive the historic inn, Baan Luang Rajamaitri : The museum resort in Chantabun Riverside Community. 11.30 – 12.30 hrs. Sight seeing – having lunch in Chantabun Riverside Community. 12.30 – 14.30 hrs. Visit House No. 69, the community learning home and the gem market. Visit the Cathedral the Immaculate Conception, Chanthaburi, the most beautiful cathedral in Thailand. 14.30 – 15.30 hrs. Rent a bike at the church for sightseeing trip/ check-in and unload your belongings. 16.00 – 17.30 hrs. Ride a bicycle in the evening around Chantaburi/King Taksinmaharaj Park. 18.00 – 20.00 hrs. Look around the exhibition hall in the house/Food shopping at Nampu market, Sui market, and Wansuanmuang market. 21.00 hrs. Relax at your own pace/ Indulge in Chantaburi Riverside setting. 06.00 – 08.00 hrs. For the early birds, visiting Chantaburi morning market. 07.00 – 09.00 hrs. Having breakfast (Soft Serve) at the inn. 09.00 – 12.30 hrs. Depart to Pliw waterfall, Pliw district. Pay respect to Luang Rajamaitri Statue (Father of Eastern Rubber Plantation). Enjoy relaxing at the waterfall/ Have lunch. 13.00 – 14.00 hrs. Visit Buddhism Park, Wat Sak Yai. 14.30 – 16.30 hrs. Travelling along the beach line to see the red building, Kee Gai Prison and then passing Yao Laem Sing Bridge and observing fisherman village lifestyle. 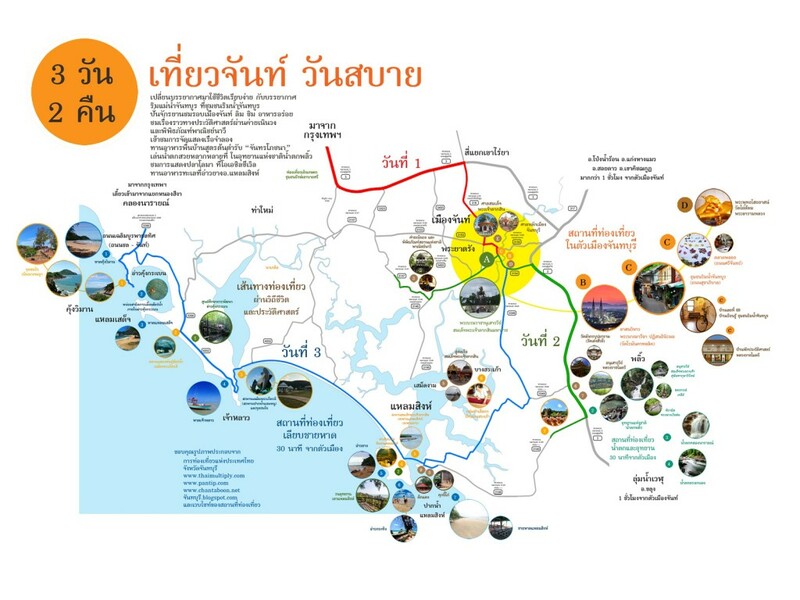 Take a break at Khao Laem Sing National Park and then getting pass Paknam Kamaenoo Bridge to observe mangrove forest eco system at Kung Kraben Bay Development Study Center. 16.30 – 17.30 hrs. Get on Chalermburapa Street track to watch senset at Nern Nangpaya scenic point. 17.30 – 19.00 hrs. Have dinner at Kung Vimarn beach and return to the inn. Experience the simple life along Chantabun riverside. Riding a bicycle around Chataburi downtown and trying delicious food. Learning history via Nern Wong Camp and visiting ship models exhibition at The National Maritime Museum. Have an original recipe of the local meal at “Chantorn Poshana”. Relax at several waterfalls in Pliw National Park and see the dophin show at the Oasis Sea World before having seafood at Ao Yang, Laem Sing district. 09.00 – 10. 30 hrs. Arrive Chantaburi downtown. Pay respect at City shrine and King Taksin Shrine. 10.00 – 11.30 hrs. Arrive Luang Rajamaitri, the historic inn. Look around the exhibition hall in the house. 11.30 – 14.30 hrs. Have lunch at your own choice at Ta Luang Bon. Check-in and relax at your own pace. 13.00 – 16.00 hrs. Walking around the community and visiting the learning house no. Taste desserts at “Aroi Rimnam”/ visit the gem market and the Cathedral of the Immaculate Conception. 16.00 – 17.30 hrs. Visit King Taksin Shipyard. 18.00 – 20.00 hrs. Have a local dinner from “Chantorn Pochana” at the terrace of Baan Luangrajamaitri, the historic inn. 06.00 – 07.30 hrs. Visit Chantaburi morning market. 07.00 – 09.00 hrs. Have breakfast (Soft serve) at Luang Rajamaitri, the historic inn. 09.30 – 11.00 hrs. Visit Nern Wong Camp and The National Maritime Museum. 11.30 – 13.0 hrs. Have lunch at Jae Pen Yen Ta Fo, Pai Lom Branch (Crab-Mantis shrimp yentafo). Pay respect at Saiyart Buddha Image at Wat Pai Lom and have a massage for relaxation. 18. 30 – 20.30 hrs. Make your dining choice between Nampu Market or Sui Market. 07.00 – 08.30 hrs. Have breakfast at the inn/ Check-out. 09.00 – 09.30 hrs. Visit King Taksin Shipyard and pay respect at King Taksin Statue. 09.30 – 11.00 hrs. Depart to Ban Bangsragao to observe mat threading and buy some souvenirs. 11.00 – 14.00 hrs. 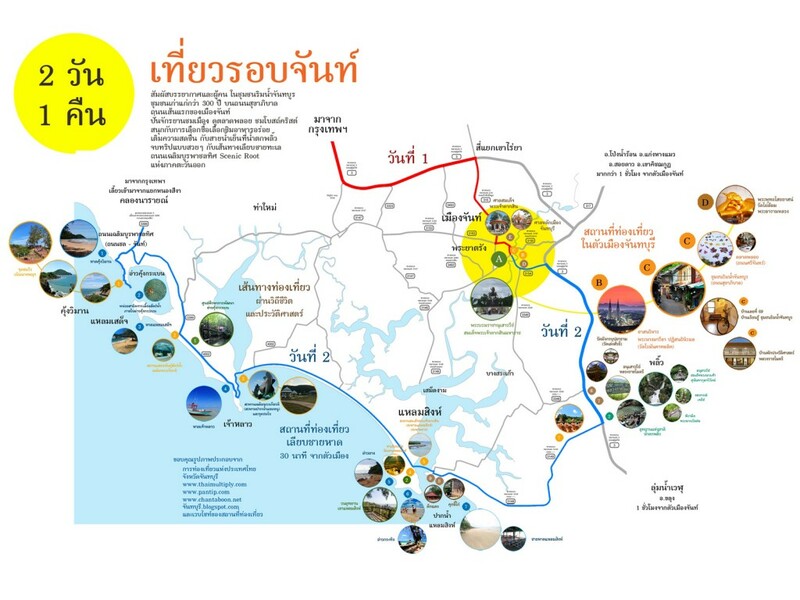 Travel along the beach line to see the red building, Kee Gai Prison and then passing Yao Laem Sing Bridge. Have lunch at Ao Yang. 14.30 – 16.30 hrs. Observe mangrove forest eco system at Kung Kraben Bay Development Study Center and various species of fish at Marine lives center.